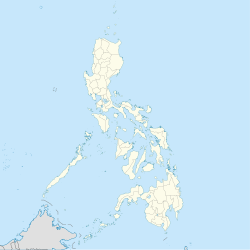 Datu Paglas, officially the Municipality of Datu Paglas, is a 4th class municipality in the province of Maguindanao, Philippines. According to the 2015 census, it has a population of 28,387 people. Datu Paglas is politically subdivided into 23 barangays. Datu Paglas was created out of 7 northern barangays of the municipality of Columbio on November 22, 1973, by Presidential Decree No. 340. While Columbio was made part of the province of Sultan Kudarat, Datu Paglas was made part of the province of Maguindanao. ^ National Statistical Coordination Board. "PSGC Interactive: Municipality/City: DATU PAGLAS". Retrieved 2008-05-19. ^ Chan Robles Virtual Law Library (1998-07-19). "Presidential Decree No. 340". Retrieved 2008-05-19. ^ Chan Robles Virtual Law Library (1998-07-19). "Presidential Decree No. 341". Retrieved 2008-05-18. ^ "Datu Paglas, Maguindanao : Average Temperatures and Rainfall". Meteoblue. Retrieved 19 January 2019. This page was last edited on 24 February 2019, at 09:15 (UTC).